Passenger train service between Detroit and Grand Rapids could be reinstated in the next decade if state transportation experts determine the public has an appetite for a new line and can figure out how to pay for it. Supporters say the idea of connecting Michigan’s two largest cities by train is gaining appeal on both sides of the state as each undergo economic and cultural revivals making passenger service more appealing to business travelers and tourists. The Michigan Environmental Council, the Lansing-based group that supports increasing public transportation options, has undertaken a $100,000 feasibility study and embarked on a series of hearings this summer along the route to get the public’s input. More hearings are scheduled later this month in Dearborn, Plymouth, Ypsilanti and Brighton. Also involved in the effort are the Ann Arbor Area Transportation Authority and the Michigan Department of Transportation. Even boosters acknowledge that re-instituting the service will be challenging. “Getting rail service up and running is a very difficult task,” said Kathleen Lomako, executive director of the Southeast Michigan Council of Governments, which helps regional leaders with transportation planning. SEMCOG has been working on a passenger rail project from Ann Arbor to Detroit for years and struggled with funding. The Detroit to Grand Rapids line isn’t the only one being explored. 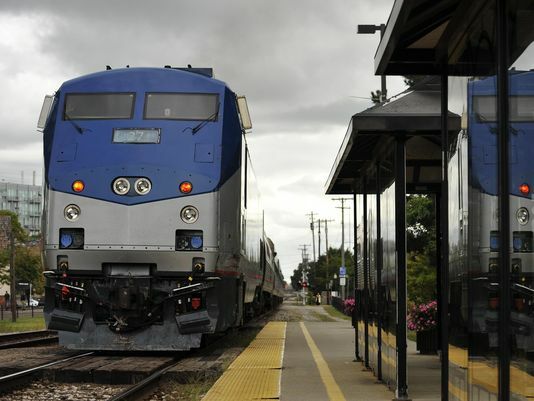 Preliminary discussions have been underway for months on establishing a rail connection from Ann Arbor to Traverse City. The Michigan Land Use Institute is pushing MDOT officials to study the feasibility of the route using existing freight rails with the hope that it could be operational by 2025. Michigan hasn’t had a Grand Rapids-to-Detroit line since Amtrak was created in 1971. Those heading the effort said that four feasibility studies on resuming service were done in the 1980s through 2002. The current Coast-to-Coast Passenger Rail study is examining three possible routes that would run on freight tracks from Holland through Grand Rapids and Lansing and to Detroit. Two routes would go through Ann Arbor; one going through Jackson and Ann Arbor and the third through Plymouth and Brighton. The study will be conducted by a transportation management firm to determine cost, time, ridership and how to fund it. It will also consider public feedback given at meetings held by the Michigan By Rail team, a coalition of organizations led by MEC and the Michigan Association of Railroad Passengers. Organizers said the line could take a decade to implement. The train, Treutel said, would have to go between 79 and 110 mph to compete with car travel. The only way to get from Detroit to Grand Rapids and back by passenger train involves traveling to Chicago and connecting for a return trip. Andrew Layman, who lives in Ann Arbor and attended a public hearing on the rail project there last month, said he’s interested in seeing better rail options in the state that are “reliable and affordable.” But he worries about whether the public will eventually support the service with tax dollars. But Heartwell sees more taxes as the stumbling block. “If you are looking at Proposal 1, you say it’s a pretty slim appetite,” the mayor said of last spring’s statewide road proposal that was trounced by voters. State officials said they are interested but proceeding cautiously. Still, Treutel said there is a “viable reason to look at this right now” in part because Amtrak ridership has been climbing over the last decade. Michael Ford, the CEO of the Regional Transit Authority, said that although his focus is on improving transit in southeastern Michigan, the discussions for the passenger rail service are important for the public to weigh.